Use dry ice to make your jack-o-lantern extra spooky this Halloween! The Jack-O-Lantern is the quintessential decoration for Halloween. No Halloween is complete without one! 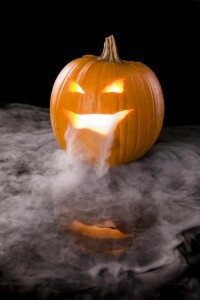 Here at Dry Ice Corp, we have the perfect way to use dry ice in your Jack-O-Lantern to create a chilling fog effect! Ready to spook the neighborhood kids or your party guests? Here’s how to create a spooky fogging Jack-O-Lantern! Here is what you’ll need to create the spooky Jack-O-Lantern: one large pumpkin, one large glass, hot water, a cup of salt, and dry ice. You’ll also need all of the implements to carve a pumpkin, such as scrapers, knives, chisels, power tools, and stencils or designs if needed. Don’t forget to practice good safety techniques when handling dry ice and sharp tools! When choosing a pumpkin, make sure you pick one that is large enough to hold a large can inside. Clean out the inside of your pumpkin and carve a friendly or scary face on the front. Use a design if needed! To maximize the effect of the dry ice, keep in mind that carbon dioxide sinks and thus will flow more out of the bottom of the pumpkin. When you are done carving and cleaning the pumpkin, fill your large glass about halfway full with hot water and mix in the cup of salt. Use a glass taller than the eyes of the pumpkin to get the fog flowing through all of the openings of the carving. Place the glass inside the pumpkin. Wearing gloves, drop 2 or 3 large pieces of dry ice into the cup of water and close the top of the pumpkin, making sure the top is snug so that air currents do not dissipate the fog. As the water cools, add more hot water to maintain the fog. One pound of dry ice should create around 2-3 minutes of fog effect, so add more dry ice as necessary to prolong the effect! With your spooky Jack-O-Lantern, you should have the best decoration in the neighborhood! Dry Ice Corp is the largest regional supplier of dry ice products and customized delivery services in the Northeastern United States, from Virginia all the way up to Maine. And because our dry ice is supplied by manufacturing plants located right here in the Northeast, we can guarantee freshness. Other suppliers, meanwhile, get their dry ice from manufacturing plants as much as 1,000 miles away, which has a direct impact on product freshness. Ready to get your dry ice for a haunted house? Click here! Dry Ice Corp provides the highest levels of service and freshest dry ice products. Contact Dry Ice Corp for a FREE Quote! You can also connect with Dry Ice Corp on Facebook, Google+, Twitter, and Pinterest. This entry was posted on Tuesday, October 18th, 2016	at 4:24 PM	and is filed under Halloween	. You can follow any responses to this entry through the RSS 2.0	feed. Both comments and pings are currently closed.